Eczema is a common problem that causes the skin to become inflamed. People often also call it dermatitis. Here's a look at the types of eczema and their treatments. Atopic dermatitis usually begins during infancy or childhood. But it can strike people at any age. Foods, dust mites, and other allergy triggers can also make symptoms worse. Drugs that control the immune system including dupilumab (Dupixent), which is given as an injection every two weeks, and crisaborole (Eucrisa), a non-steroidal ointment that is used topically twice a day. Irritant contact dermatitis can develop after touching a strong irritant one time or by coming into contact with the irritating substance repeatedly. The hands are especially vulnerable to developing contact dermatitis. People can develop contact dermatitis even if they don't have atopic dermatitis. Treatments for contact dermatitis from allergic triggers also include steroid drugs. These are rubbed on the skin or taken as a pill. For either type of contact dermatitis, antibiotics may be necessary. Avoiding future contact with the irritant or allergy trigger is also important. Wearing gloves can help protect the skin on the hands, which are often affected. This type of eczema affects the hands and feet. The cause is unknown. The first symptom may be severe itching. Blisters may then appear, which give way a few weeks later to scaly patches. Sometimes deep cracks can appear on the hands or fingers. This type of eczema may become chronic and painful. This type of eczema more often affects men than women. Men usually don't get their first outbreak before their mid-50s. Women tend to get it in their teen years or early adulthood. 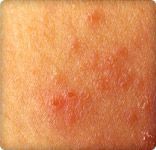 People with this type of eczema develop skin irritation in spots that they frequently scratch out of habit. People may scratch affected areas during the day without realizing it. They may also scratch while asleep. Usually, neurodermatitis causes a skin outbreak that doesn't get any bigger. But the irritated skin can grow thick and deeply wrinkled. Infections may also develop in the irritated areas. The main treatment for this type of eczema is to stop scratching it. In the meantime, steroid medicines that are rubbed onto the skin can help treat symptoms. When neurodermatitis affects the scalp, it can be harder to treat. In these cases, it may require the steroid medication prednisone, which is taken by mouth. Seborrheic dermatitis causes skin to fall off in flakes. The condition may be due to an overgrowth of a type of yeast that normally lives in these areas, as well as an overgrowth and rapid shedding of cells on the scalp. It may be especially hard to treat in people whose immune systems aren't working properly, including people withAIDS . This type of eczema can develop in people when the veins in their lower legs don't properly return blood to their heart. Stasis dermatitis can arise quickly, causing weeping and crusting of the skin. Over time, this type of eczema can cause the skin to develop brown stains. Habif, T. Clinical Dermatology, 5th edition, Mosby, 2009. National Institutes of Health: "Handout on Health -- Atopic Dermatitis." Cleveland Clinic: Current Clinical Medicine, 2nd edition. American Academy of Dermatology: "Nummular Dermatitis," "Dermatitis." American Academy of Family Physicians: "Seborrheic Dermatitis."